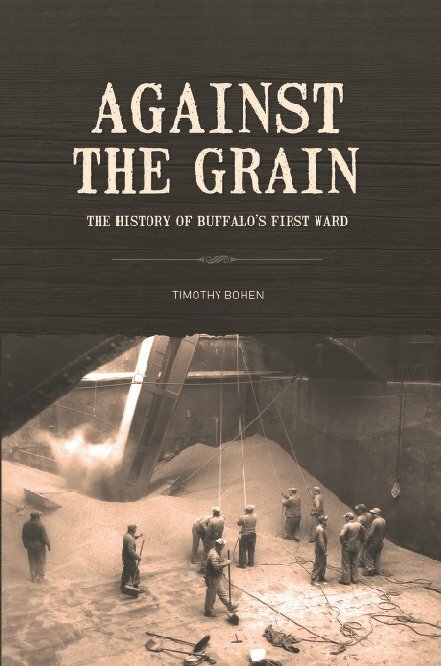 With Against the Grain, Tim Bohen Jr. tells the story of a group of mostly Irish immigrants who toiled in the hulls of grain ships and in other waterfront industries in an area called the First Ward of Buffalo, NY. This economically deprived area produced an abundance of important people including Fingy Conners, the largest private employer on the Great Lakes; Michael Shea, Buffalo's greatest entertainment showman; "Wild Bill" Donovan, the founding father of the OSS; John Sheehan, one-time Tammany Hall boss; Jimmy Slattery, the Light Heavyweight Champion of the World; and Jimmy Griffin, the longest serving mayor in Buffalo history. The stories of other equally important Ward residents such as Mike Quinn, Jack White, Algie McGuire, Roggie Lavin, Father Thomas Conway, the McCarthy brothers, and even Rick James are also told. Readers will also learn about the Tidal Wave of 1844, the Fenian Raid, the Great Strike of 1899, the Tewksbury Disaster, and the opening of the St. Lawrence Seaway.